As his players grab handfuls of pregame gummy bears, Patrick Surtain tightens his belt and tucks in his black polo. NBA YoungBoy’s “Untouchable” is blaring from the sweat box that is Miami Dade College’s Nathaniel Traz-Powell Stadium and one of the best high school football teams in the nation bubbles in anticipation. Surtain, a former NFL All-Pro cornerback, recognizes these moments of nervous fury and anxiousness. He also knows how unusual this team is: Two of these players — his son, Patrick Surtain Jr., and Tyson Campbell — are the nation’s best cornerbacks, according to ESPN 300’s Class of 2018 rankings. It is the first time in modern recruiting history that the nation’s top two corners play for the same team. American Heritage School head coach Patrick Surtain, center, talks with the offense during practice. Surtain Jr., the nation’s top-rated corner and the No. 6 overall prospect this year, has attracted interest from LSU, Alabama, Florida State, Florida and Ohio State. Campbell, the No. 2 corner in the country and No. 8 overall prospect, also is looking at a who’s who of national powers, including Alabama, Georgia, Ohio State, Miami, LSU, Florida and Florida State. 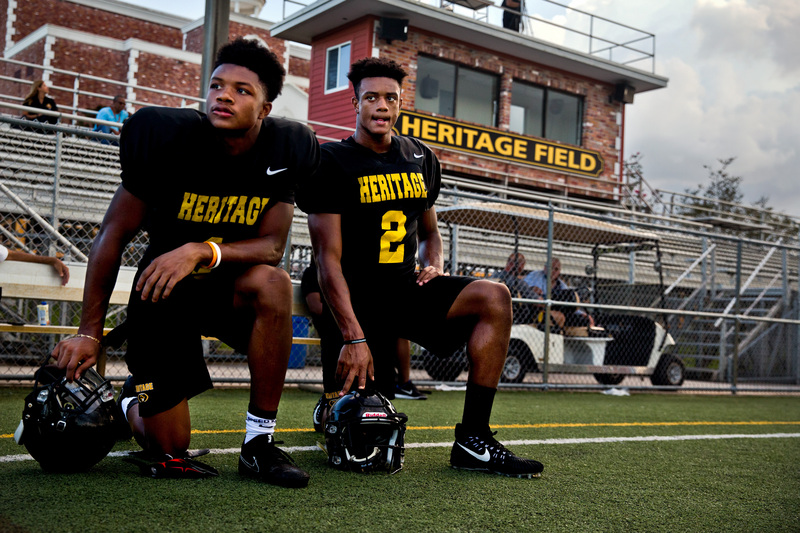 Their school, American Heritage, located in a suburb of Fort Lauderdale, Florida, has won three of the last four Florida 5A high school football championships and is ranked in the top 10 nationally. Obviously, expectations are high again this year, something the coach says one more time to his team. Patrick Surtrain Jr. keeps his eyes locked on the receivers before they run a play during practice. So far, it’s in the conversation. The team was 2-0 before Hurricane Irma forced a break in the schedule. Like much of the state, the school lost power, and parts of it, including the football field, were flooded. Classes resumed on Sept. 18. And after missing two games because of the storm, the team is scheduled to play another Fort Lauderdale-area school, Chaminade-Madonna, on ESPNU on Sept. 22. Campbell, a 6-foot-3, 181-pound senior, sees their national recognition as an honor and a blessing, but he also recognizes the pressure that it brings. Tyson Campbell, left, runs a defensive drill during practice. How exactly did this happen? How did an NFL great end up coaching a national high school power with the country’s top two corners? It’s a scenario that’s been 16 years in the making. And it started shortly after the Surtains had their first child, when they moved to a neighborhood right across the highway from a school they initially didn’t know existed. A painting of Patrick Surtain during his time as a Miami Dolphin hangs in his office. In 2001, when Surtain Sr. was playing for the Dolphins, the family moved to Plantation, a community west of Fort Lauderdale. The couple had just had Patrick Jr., the first of their three children. Michelle Surtain thought of the area as a “very nice neighborhood” that had the advantage of being a short drive to the Dolphins’ facilities. They had no idea they were around the corner from American Heritage, and they certainly weren’t aware of its reputation. When the Kansas City Chiefs released Surtain Sr. in February 2009, the 11-year veteran didn’t know what he wanted to do next. Chronic shoulder problems had plagued him that season, and Surtain Sr. returned home to Plantation knowing that he might not get a call from another team. Michelle Surtain was pregnant with their youngest child, and Surtain Sr. opted not to immediately look for a job in favor of spending time with his son and daughter. That included finding a park for Patrick Jr. to play Optimist football. Eventually, the father stepped up to coach his son. Patrick Surtain and his son Patrick Surtain Jr. The first time Campbell got the ball in an Optimist game, it was clear he was going places. In this case, the 6-year-old had lined up at running back and ran for a touchdown. He still smiles remembering that season and touchdown. 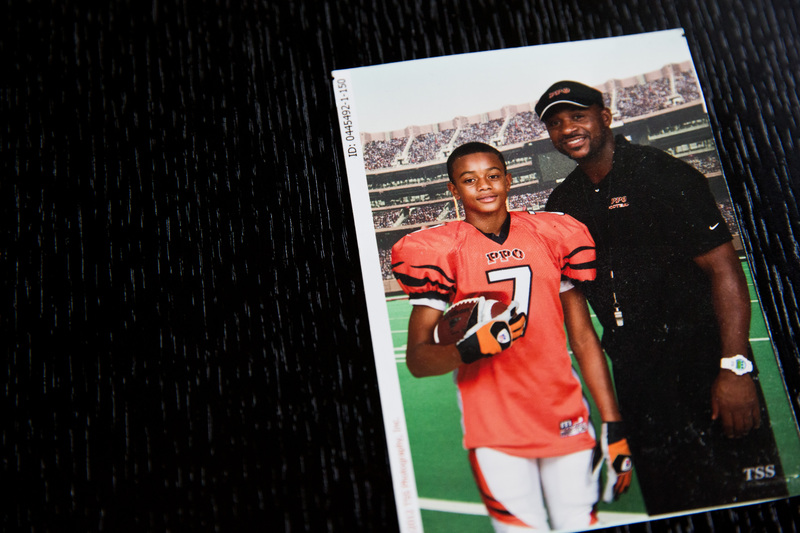 When Campbell was 9, he met Surtain Jr. at the park where both played Optimist ball. Although they were the same age, Surtain Jr. was playing up an age level. Campbell remembers catching the eye of the elder Surtain. Tyson Campbell, left, and Patrick Surtain Jr.kneel during practice. They fell out of touch when Surtain Jr. went to a different park to play ball. But Campbell recalled the experience years later when his Optimist coach talked to him about playing for a school called American Heritage. 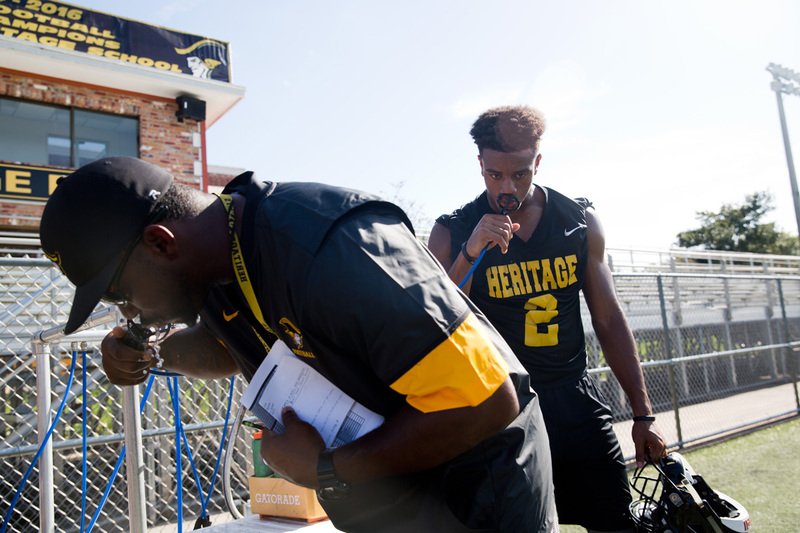 American Heritage’s rise to football prominence is another mark of accomplishment for a school that’s achieved prominence in both academics and athletics. Heritage says it is Florida’s No. 1 high school for National Merit Scholars for the past seven years — and No. 9 nationwide. Founded in 1965, the private school has 2,700 students from pre-K through 12th grade on its 40-acre campus. High school tuition ranges from $27,023 to $28,266, although financial aid is available. While the school has been a sports powerhouse — particularly the baseball program, which produced Kansas City Royals star Eric Hosmer — football hadn’t made the same jump until a few years ago. The football team was good but not great, lacking the state championship banners the school has won in baseball, softball, track and field, women’s soccer, women’s tennis and men’s golf. But its potential was enticing to Mike Rumph, then the defensive coordinator at Miami Carol City High School and a coach for West Miramar of the Optimist league. 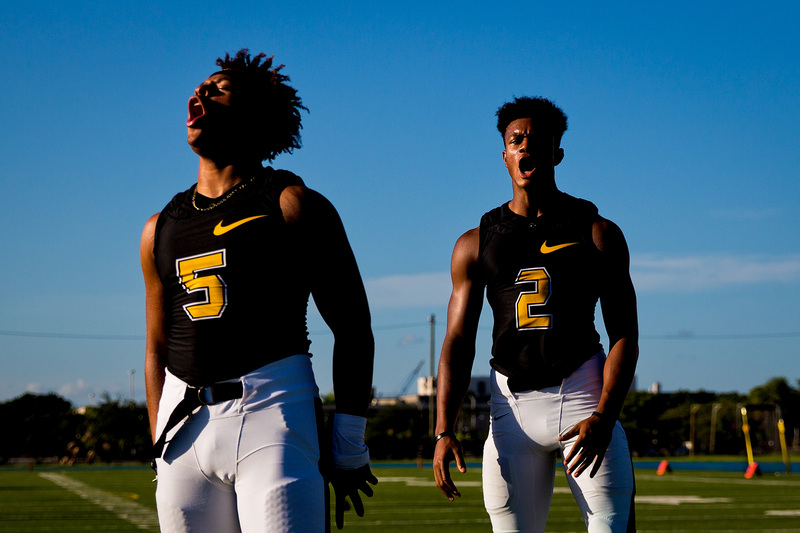 Calvin Heart Jr., left, and Patrick Surtrain Jr. pump their teammates up before American Heritage School’s game against Booker T. Washington High School. In the past five years, the school has become a destination in talent-rich South Florida. The former NFL and college stars on the coaching staff and a roster filled with some of the top recruits in the nation go a long way. That profile will only grow when Tarvarus McFadden, a Heritage alum currently starring at corner for Florida State, enters the NFL draft and when Surtain Jr., Campbell and the other seniors head off to major college programs next fall. 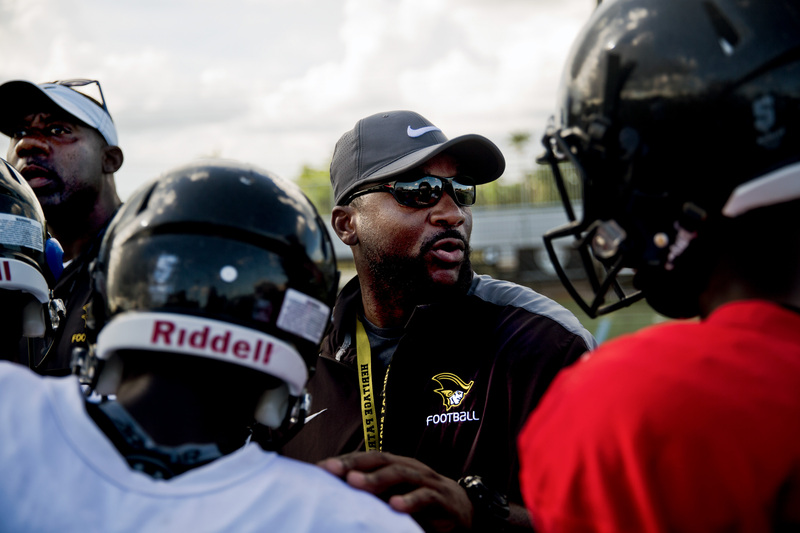 Rumph joined American Heritage as its defensive coordinator in 2011 and asked Surtain Sr., whom he knew from when both were playing in Miami, to be his defensive backs coach. When Rumph was promoted to head coach in 2013, Surtain Sr. became defensive coordinator. As part of the Optimist coaching circle, Rumph was familiar with Campbell, whom he had coached as part of the West Miramar team, and discussed playing at Heritage with him and his family. In 2014, Campbell transferred to Heritage as a freshman and his father took a job in the school’s library. All faculty and staff’s children, including Surtain Jr. and Campbell, have their full tuition covered by the school. Tyson Campbell, right, tries to knock the ball loose from Patrick Surtain Jr. during their practice. Campbell struggled with injuries, and it wasn’t always clear at what position he would be most effective. When Rumph and Surtain Sr. recommended he move to defensive back, and eventually cornerback, Campbell accepted it. From there, he’s been a force of nature. “Tyson was just too talented to keep off the field,” said Surtain Sr., who put him at safety last year after playing him at corner his sophomore year. Now he’s returned to his natural position, his coaches say. With that development, the boys connected as teammates and friends. Rumph took the team to two consecutive state championships in 2013 and 2014 before falling short in 2015. He left to be the cornerbacks coach at the University of Miami and recommended Surtain Sr. as his replacement. The former NFL star turned loud parent at youth football games was now manning the wheel at one of high school football’s crown jewels. “I knew he was going to make the team better and be a father figure for everyone,” his son said. In 2015, the family moved to a house even closer to the school — so close that they can walk there when it isn’t unbearably hot. Surtain Sr. said separating his responsibilities as coach and father has been easy. By letting his staff be the primary coaches for his son, he can be dad at home. And Michelle Surtain is handling Patrick Jr.’s recruiting. “When we’re home, we’ll talk football a little bit, but we’re just family,” Surtain Sr. said of his son. In his second season as head coach after going 14-0 the first year, Surtain Sr. figures to become a wanted commodity at the next level. Though he said he would entertain the right opportunity, Surtain Sr. wants to enjoy the now, whether it’s watching sports with his son or doing dance moves with his daughters. 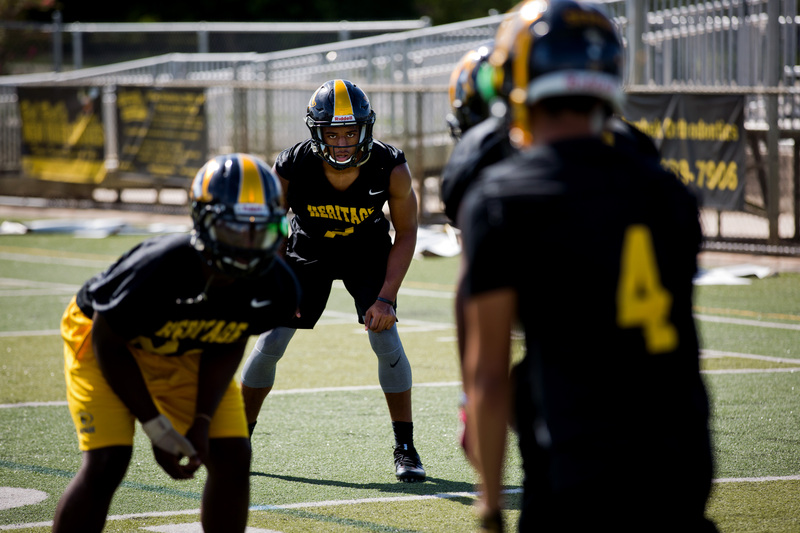 Two days before the Booker T. Washington game, Surtain Sr. talks about what it takes to win the preseason affair, known around the program as “depositing that first check.” For American Heritage to continue to rise as a national power, Surtain Sr.’s offense will need to test itself. On this day, that means going against their own starting corners. The ball is snapped for a post route toward the left side of the end zone. Campbell falls a little behind, and receivers coach Oronde Gadsden, a former Dolphins wide receiver, smells blood. “We got one!” yells Gadsden. Nope. Campbell catches up and jumps over his man. Essentially straddling the receiver’s left shoulder, he hauls in the ball with both hands. Not today, offense. Patrick Surtain Jr., second from right, leaps to swat the ball during practice. Defensive coordinator Chad Wilson isn’t taking for granted what he has this year in his defensive backfield. “To have No. 1 and No. 2 on the field at the same time, I feel really, really blessed,” said Wilson, a former corner at Miami during the early ’90s whose sons, Quincy and Marco, are playing for the Indianapolis Colts and University of Florida, respectively. Next, Surtain Jr. goes up against Anthony Schwartz, one of the top 10 receivers in the country. The senior sees the ball hanging up in the air, and what happens next feels like it plays out in slow motion. Surtain Jr. launches from his left leg and reaches up with his right arm, and the ball hits his hand and pops up, only to slide back down in his hand — all before he comes crashing down with the ball in his possession. The whole team loses its mind. Nesta Silvera, a senior defensive tackle verbally committed to Miami, can’t believe what he just saw. “That’s going viral,” Silvera said, gawking. Hopping up, Surtain Jr. is met by Campbell, who slaps his hand three times in celebration. By the second quarter of the Booker T. Washington game, American Heritage has a 35-7 lead and Booker T. has decided against throwing to Surtain Jr.’s side of the field altogether. With his team up 28, Surtain Jr. is pulled for the rest of the game with a minor MCL sprain. 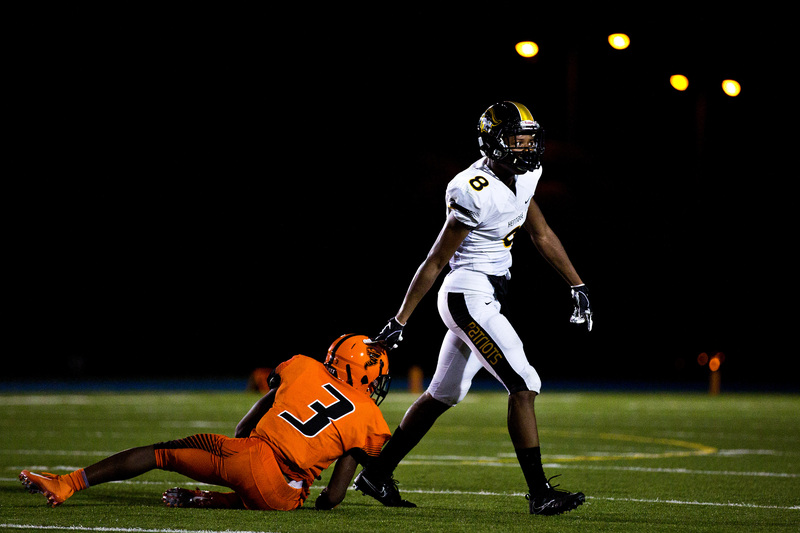 But without Surtain Jr., Booker T. goes for 20 unanswered points, throwing away from Campbell. 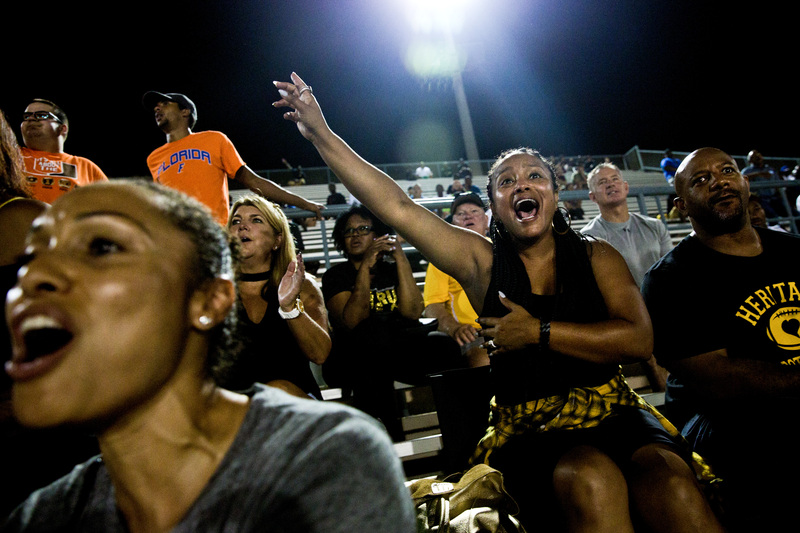 Michelle Surtrain cheers along with other fans after a good play by American Heritage School during their game against Booker T. Washington High School. A late touchdown from American Heritage is good enough for a 42-27 win. Although it’s a preseason game and doesn’t count in either team’s official record, it’s one that Heritage, with hopes of a national title, couldn’t afford to lose. Losing to Booker T. in last year’s exhibition left them out of the national title conversation although they went undefeated the rest of the way. Campbell is happy to be moving on to the next one, knowing it won’t get any easier for him or his friend. American Heritage School’s Tyson Campbell rises after taking down Booker T. Washington High School’s Willie Davis during their game on Friday, August 18, 2017. “We can show everyone in the country that the ranking they give us is true,” Campbell says. Timothy Bella is a features journalist based in Washington, D.C., whose work has appeared in Al Jazeera America, The Atlantic and The New York Times.